Five years and going strong. 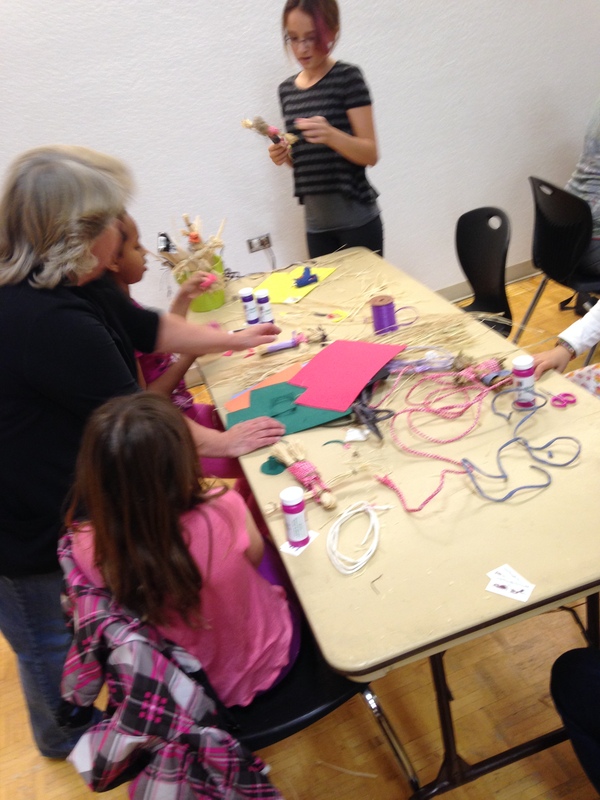 So many ways to bring community together through art. 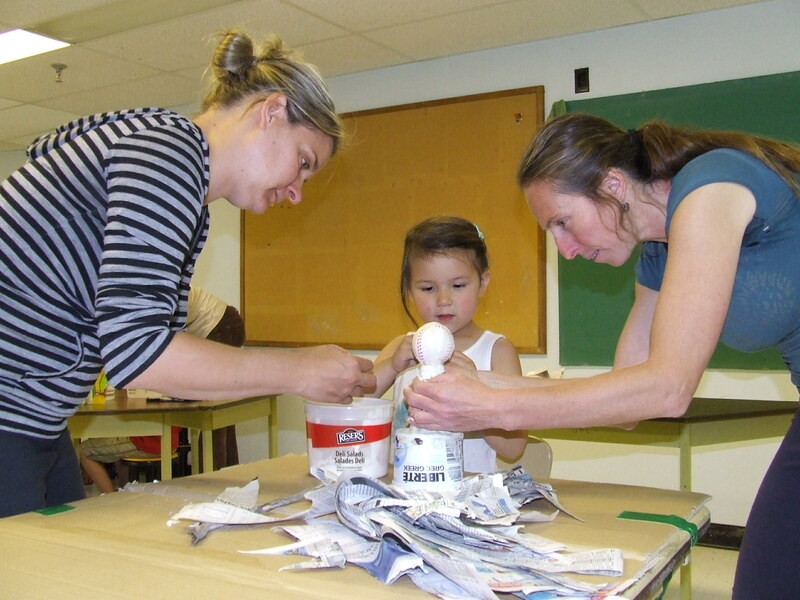 Starting in early September a partnership with Arts Jasper (celebrating 42 years of bringing art to Jasper stages!) brought some amazing musicians to town. 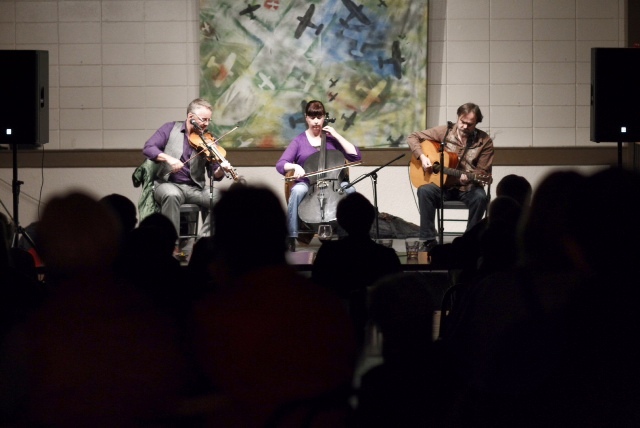 Christine Hanson, Bruce MacGregor and Andrew Hillhouse filled the Legion for an evening of celtic music, tales and even had some folks up dancing. 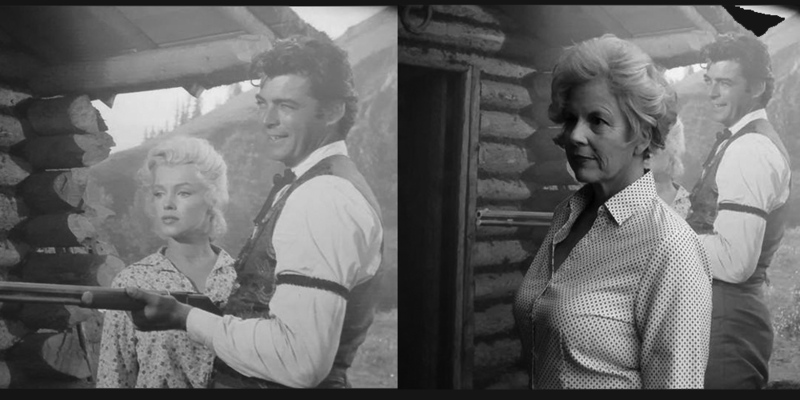 Bruce, on the left, Christine in the middle are not strangers to Jasper. And in the fall of 2015 Christine will return to present her composition commissioned by Arts Jasper to honour the life of Edith Cavell. Bruce is always full of tales, with a Scottish accent! 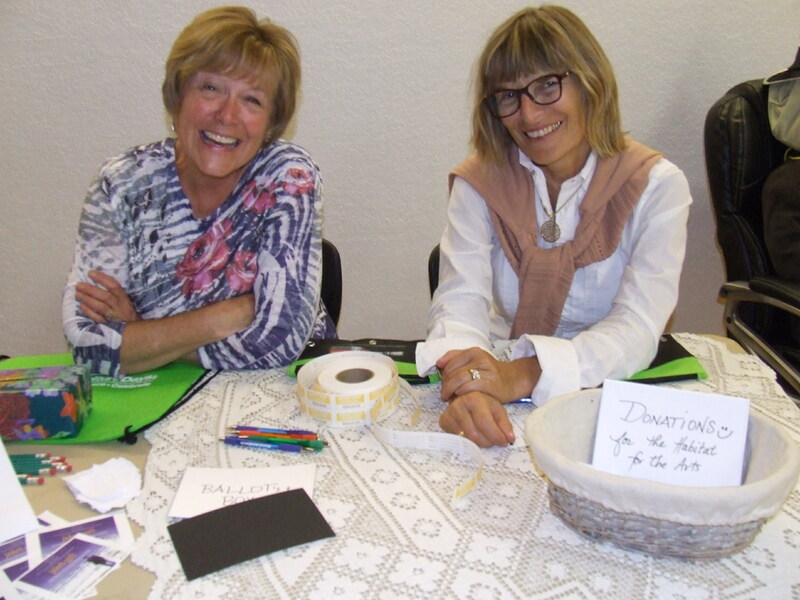 With Culture Days only a few weeks in the future and the volunteer room filling with programs and Culture Days swag and white board calendars being edited on a regular basis…we saw the second lead up event come together out at Pine Bungalows. Fitting place for a Film Festival fundraiser. 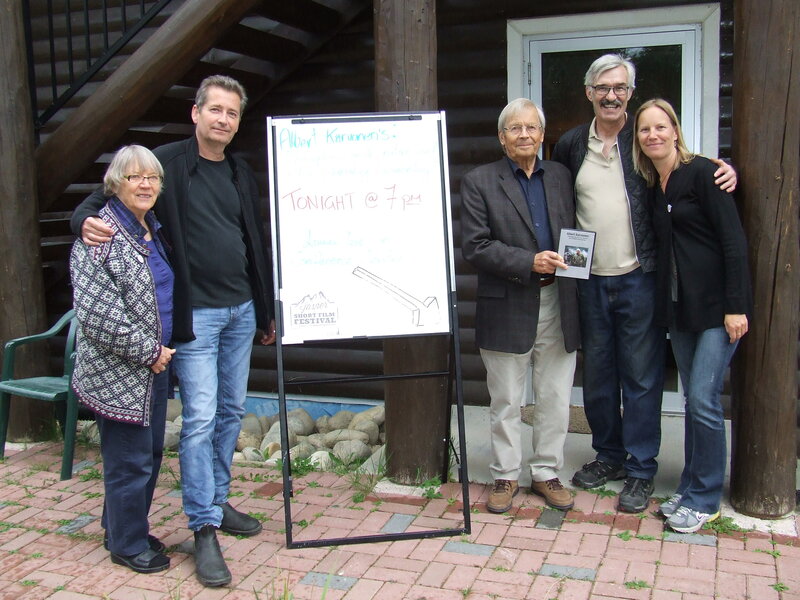 Pine Bungalows owner, Mike Wasuita, has been a supporter of Alberta Film and filmmaking for years. As an IATSE member he has offered up the Bungalows as a base for all kinds of productions. The Karvonen family are also no strangers to Jasper. 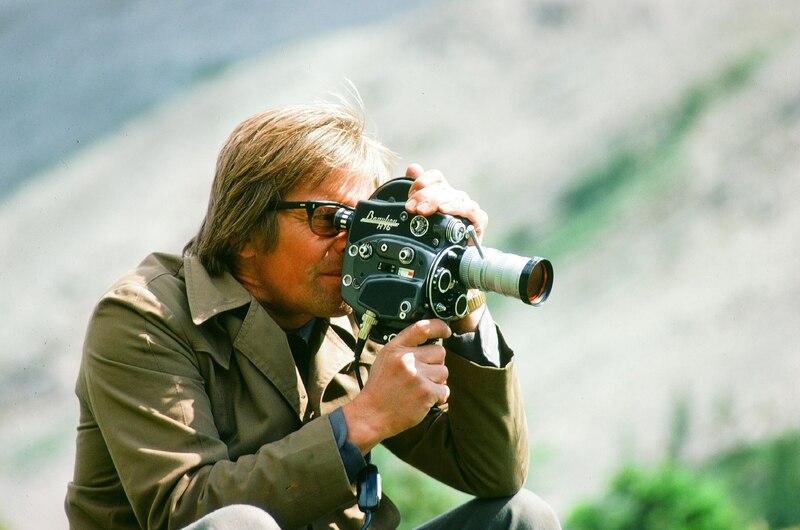 And what better place to show a documentary on Albert Karvonen made by his daughter Ava than in one of the wilderness locations that inspired his work. Albert often visited Jasper National Park to film. Screening the documentary on Albert produced by Ava Karvonen at Pine Bungalows. Any evening at Pine Bungalows is a treat and this one did not disappoint. 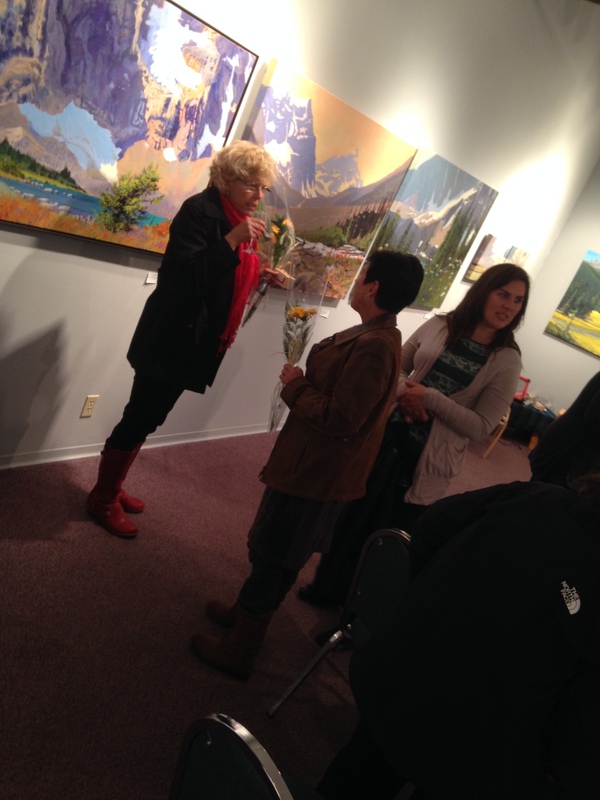 In attendance for this Jasper Short Film Festival fundraiser was Peter Wunstorf to the left of the easel above. Peter created a short called ‘Patiences’ that was selected for the Festival. 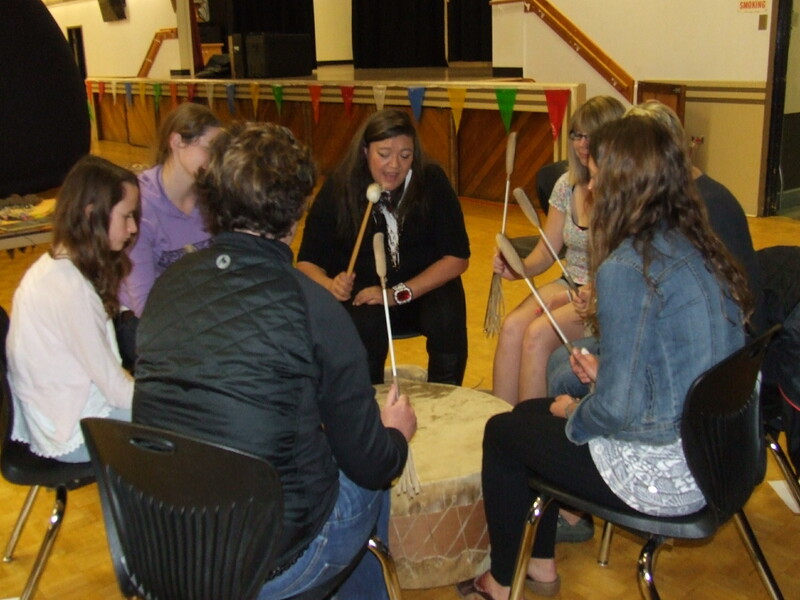 Alberta has no end to great talents and Jasper has connections for many. It is unfortunate that Culture Days is only a weekend long…so we cheat. 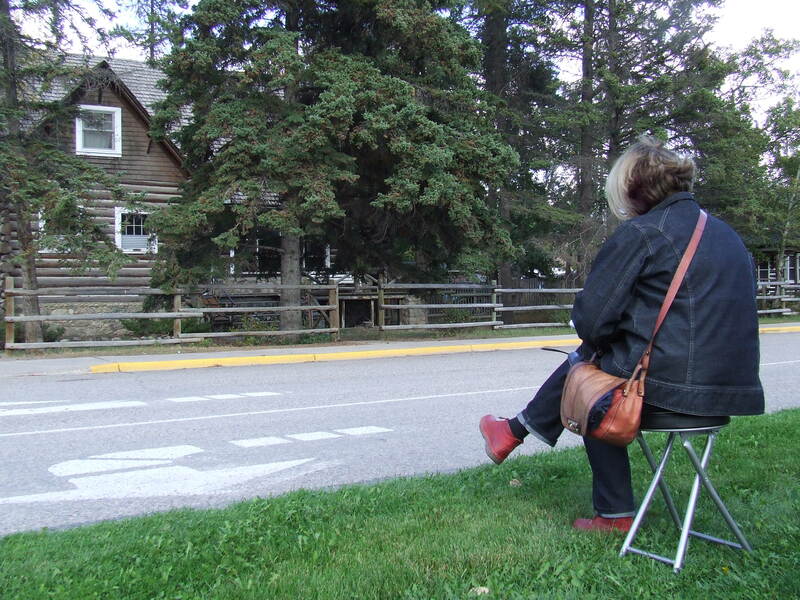 It’s difficult to get artists to come to Jasper when the entire country is celebrating Culture Days! For that reason we called on Danielle Metcalfe-Chenail to come do a writing workshop through the Library before Culture Days weekend! 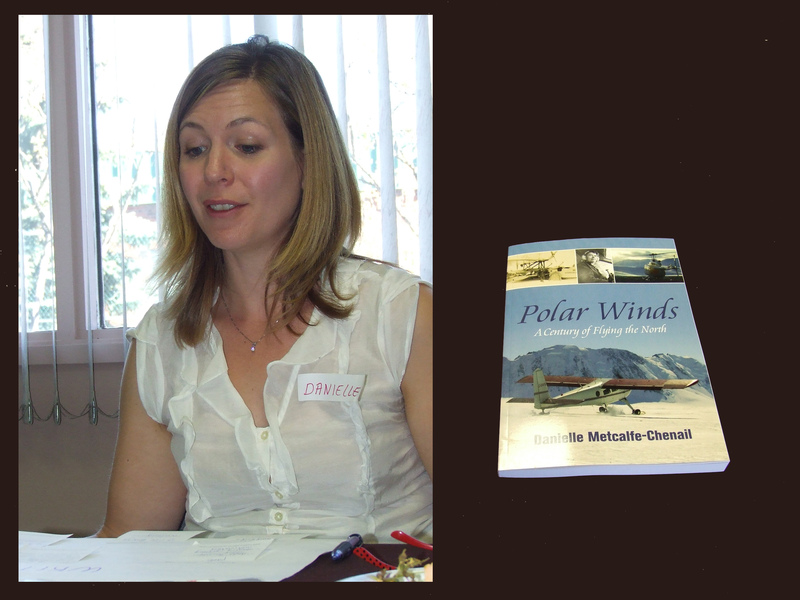 Danielle grew up in a family with a passion for aviation – and she just released her newest book ‘Polar Winds’ on flying in the North. She did a book signing at the Snowdome Coffee Bar and then a free workshop for a room full of inquisitive writers and wanna-be writers! 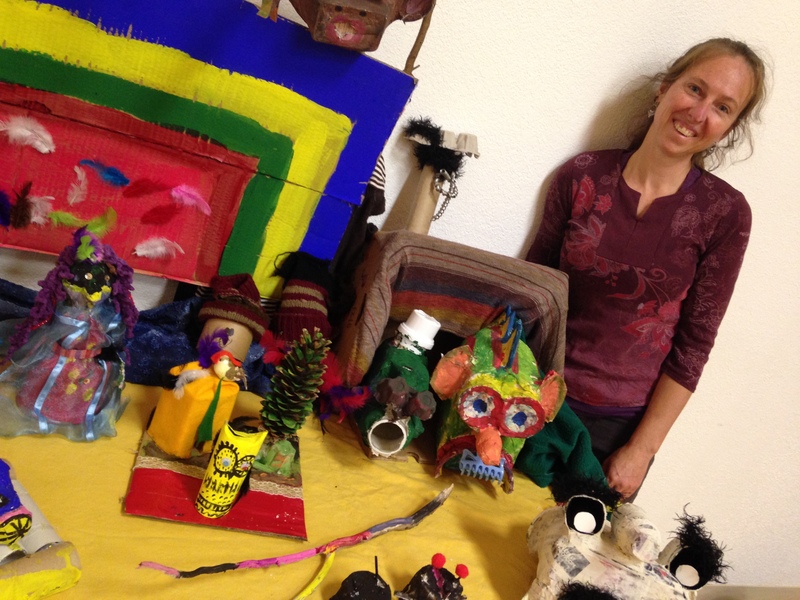 Time for Marie Helene to bring life to some inanimate objects…the annual puppet making workshop is always a treat for all ages. 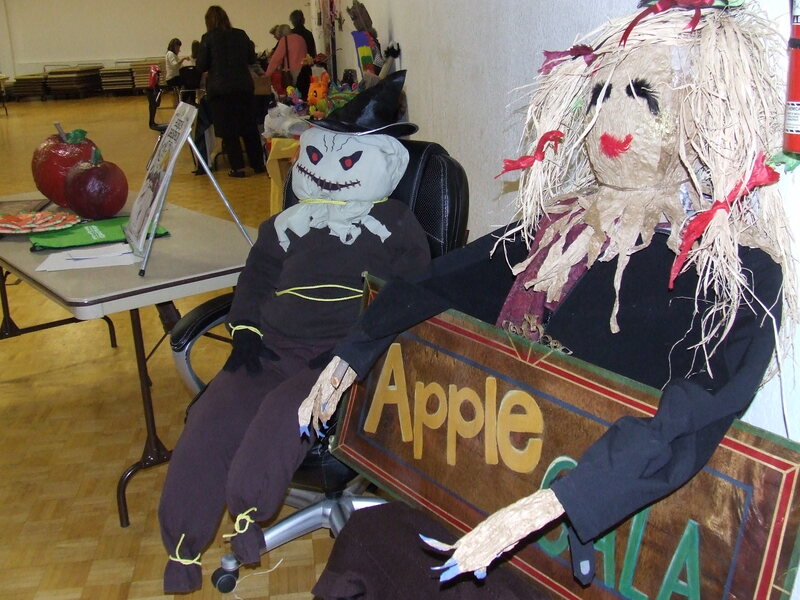 These creations were on display during the Community Fair on Culture Days weekend! One of the key events to come from this weekend dedicated to art and culture…is the annual Raven’ About the Arts Awards. 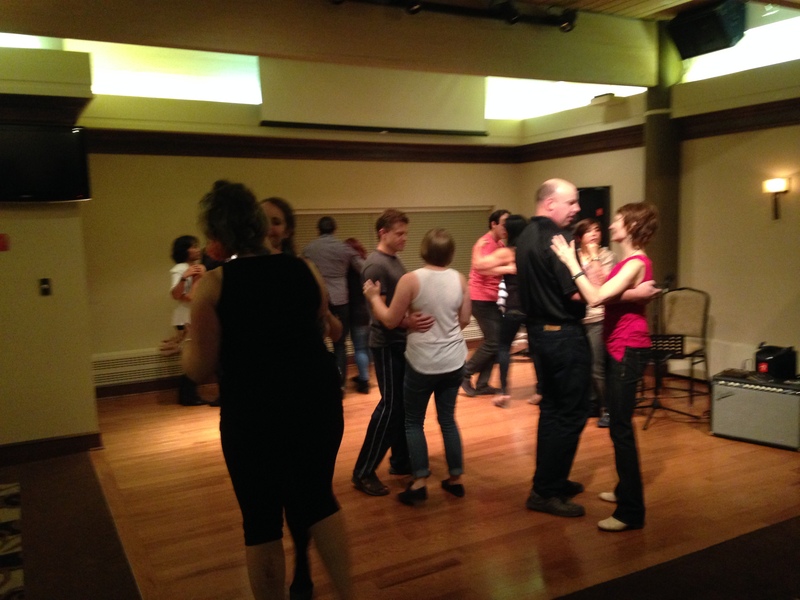 An evening that has ranged from a black tie affair at The Sawridge Inn and Conference Centre to fabulous gatherings in the Jasper Artists Guild. 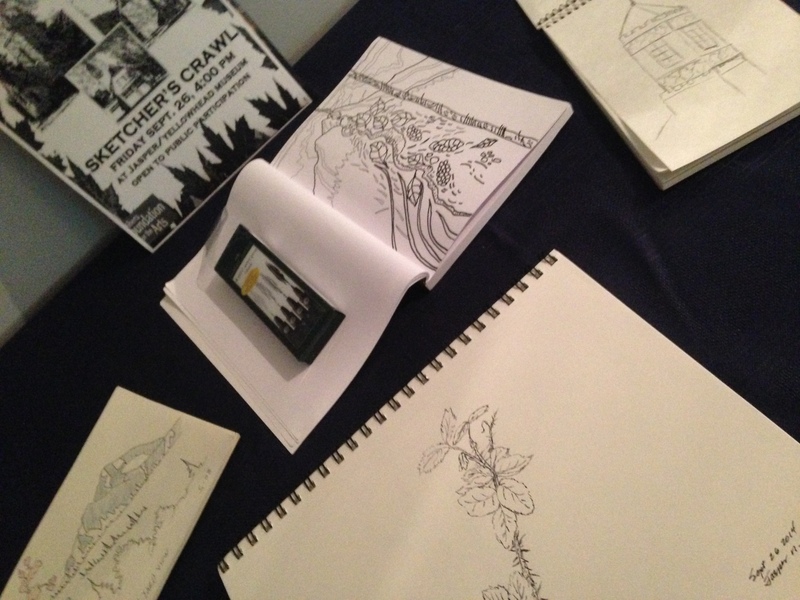 This year we had the opportunity to host the event at the Jasper Museum…surrounded by works from the Artists Guild in the Showcase Gallery. 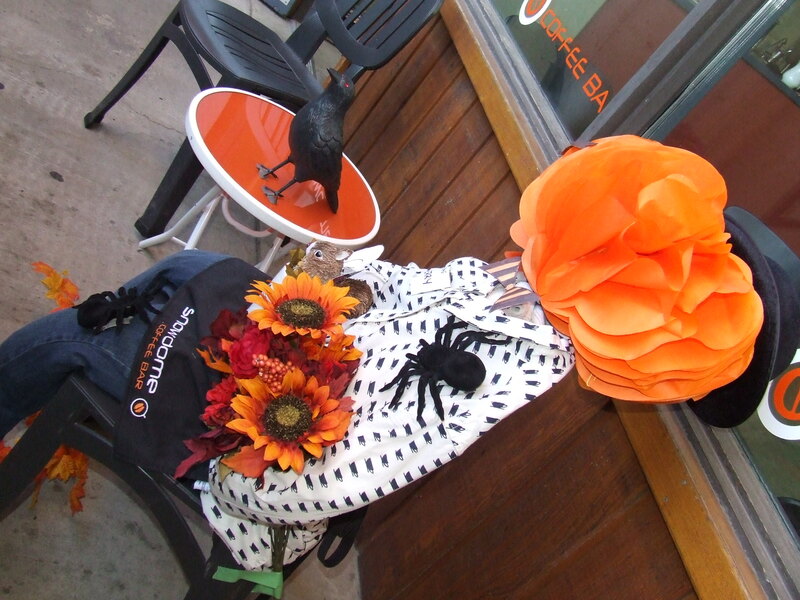 The Guild did a Sketchers crawl on a fabulous fall afternoon and then the day evolved into the evenings awards. 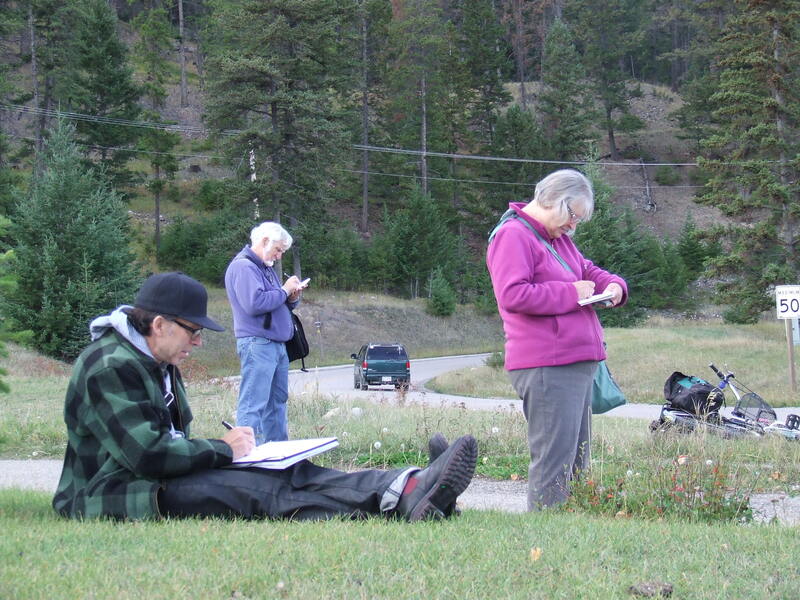 Jasper has a wealth of heritage sites to sketch…and a sketchers crawl for Culture Days! 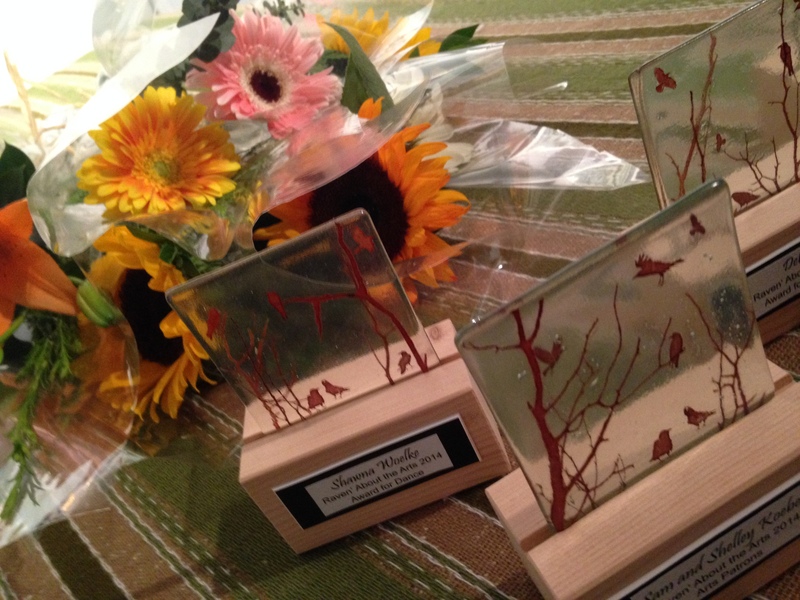 Awards were created by Urban Forest Pottery Studios – glass fused photography. 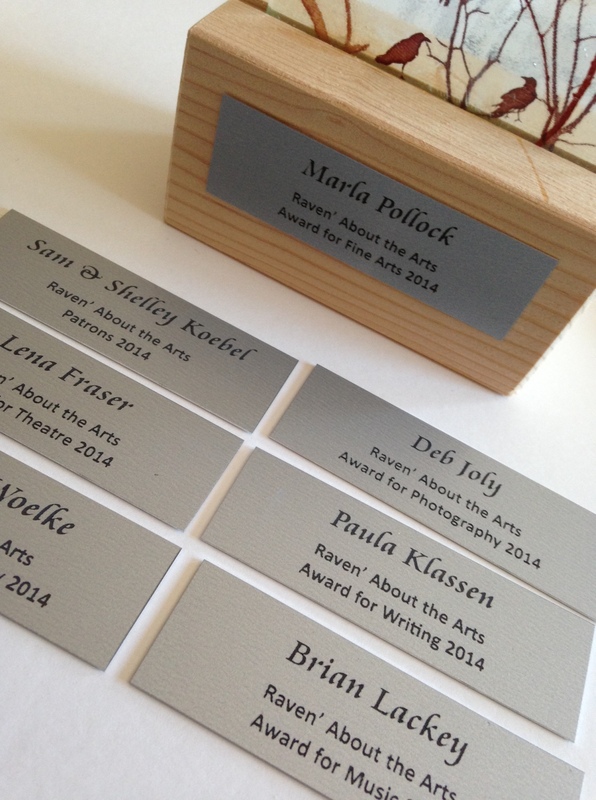 And thanks to Jasper’s very own engravers…Lucia’s Gifts…we have some very nice plaques for the awards too! Thank you Vera Forabosco for doing these up for us! Watch how they express their work in their own words! 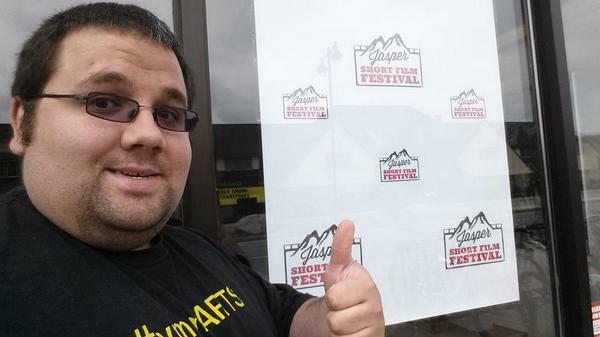 Close the doors on another Raven’ About the Arts Awards Friday night…and open the doors on Saturday morning for Jasper’s FIRST ‘madeforjasper’ Film Festival!! Starting in April the call went out across as many channels as we could think of…other festivals, websites, friends…and over 35 submissions came into the Film Fest office. From all over Canada, Quebec, Manitoba, BC…and even one from LA! Documentaries, dramatic shorts, animation…from nature to comedy…over 14 hours of programs. And the selection committee watched them all, sometimes twice. We have a fantastic small town theatre, the Chaba Theatre, that was opened to us to use for one day…6 hours…a big screen! Having the films, the theatre and even banners on the street were all good…but what about an audience!? 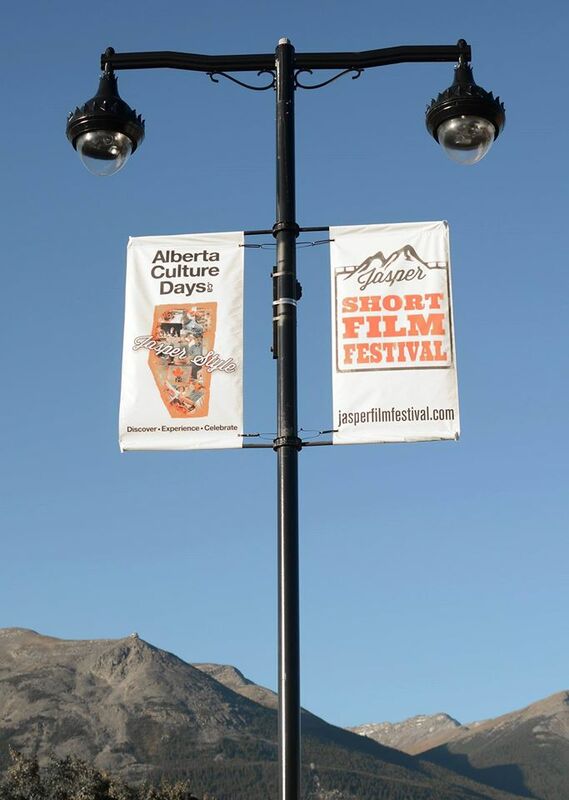 Being the first ever short film fest in Jasper, on a beautiful sunny fall day…lets just say lots of fingers were crossed. And it worked! Thank you Jasper and all the filmmakers who came from away…thanks to the volunteers who kept the tight screening schedule tight. Toddske, from Fort Mac…got away before the day ended…interestingly he was involved in the short Ninjavention. Coincidence? Peoples Choice was chosen by ballot during the day, second choice was Ancestors Calling…and third place was shared by Exquisite Taste and Through Ice and Time. 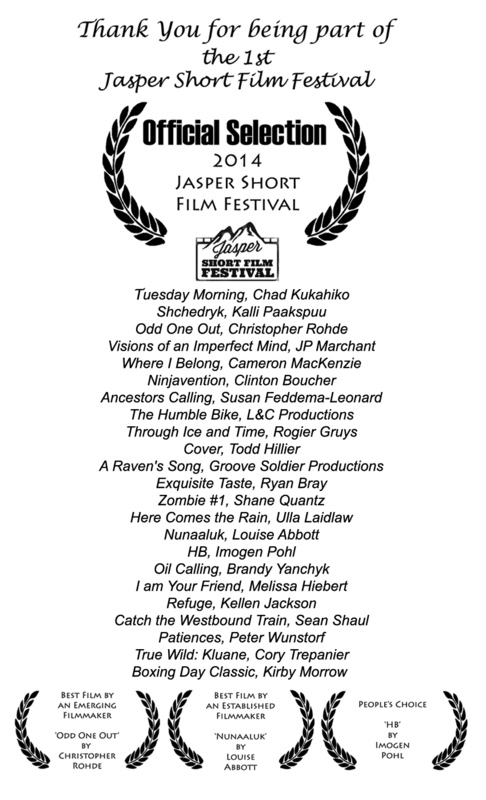 All of the award winning films and runners up for Peoples Choice will be collated into a BEST OF THE JASPER SHORT FILM FESTIVAL program to travel the region as a fundraiser! 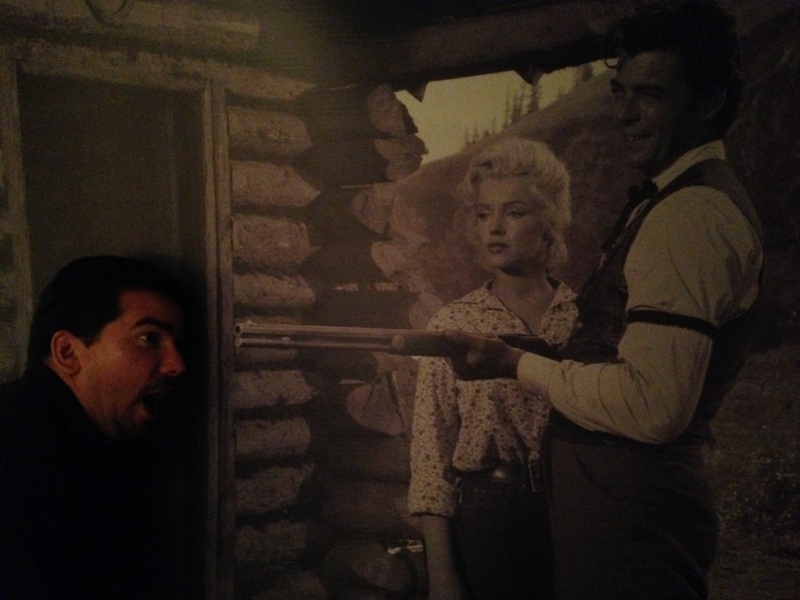 One of the more famous actors to grace Jasper soil…Marilyn made an appearance! 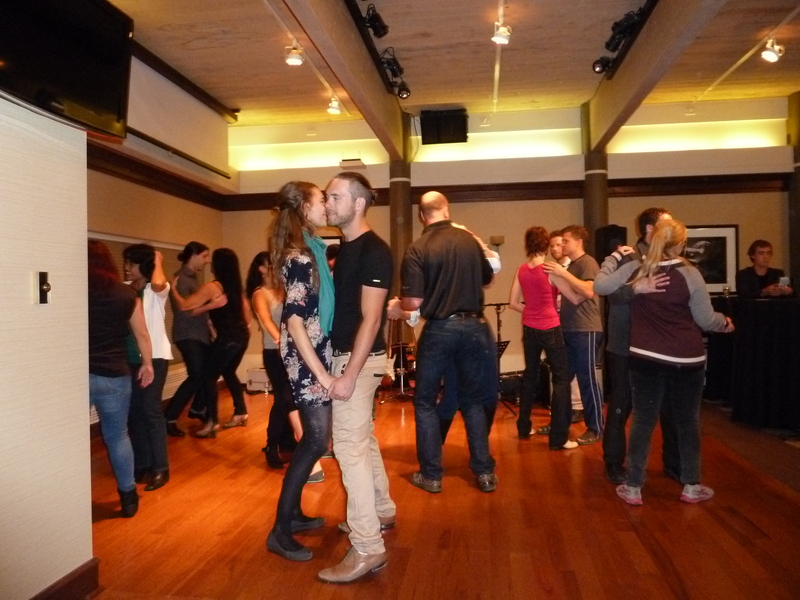 Chad Krayenhoff of Jasper’s blues fusion dance group brought some life to the floor…what better way to get a room of strangers mingling? 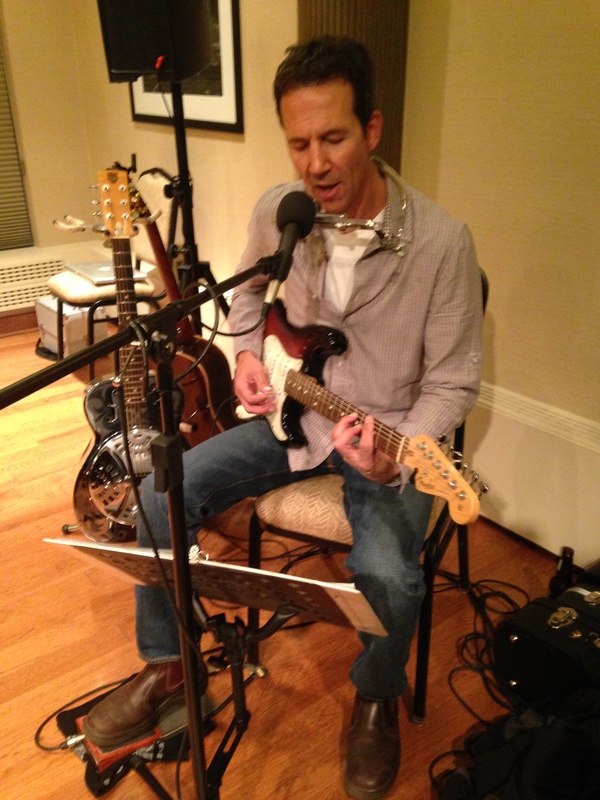 And who better to play blues for blues dancers than Jasper’s own Brian Lackey…who was this years award winner for music at the Raven’ About the Arts Awards! 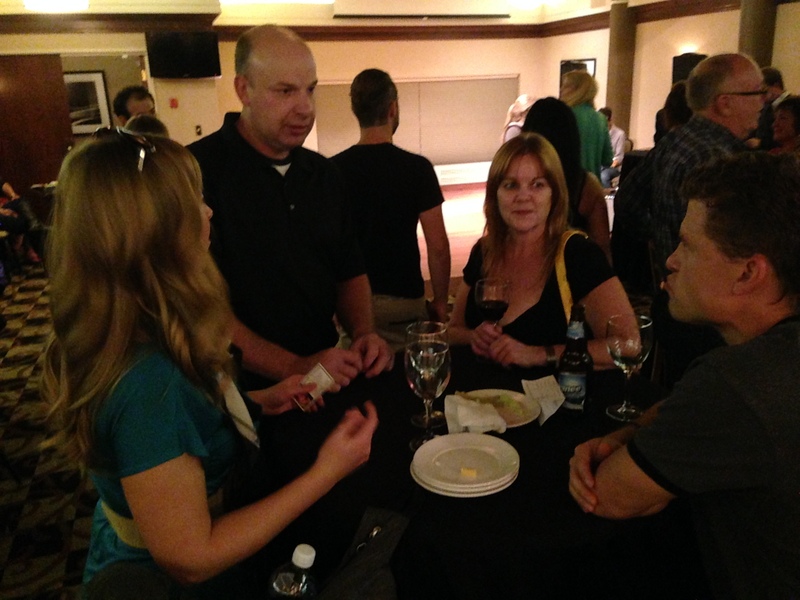 Mingling at the Jasper Inn! Who knew magic was so much fun! Sometimes things can get out of hand…but no filmmaker was harmed in the making of Culture Days! 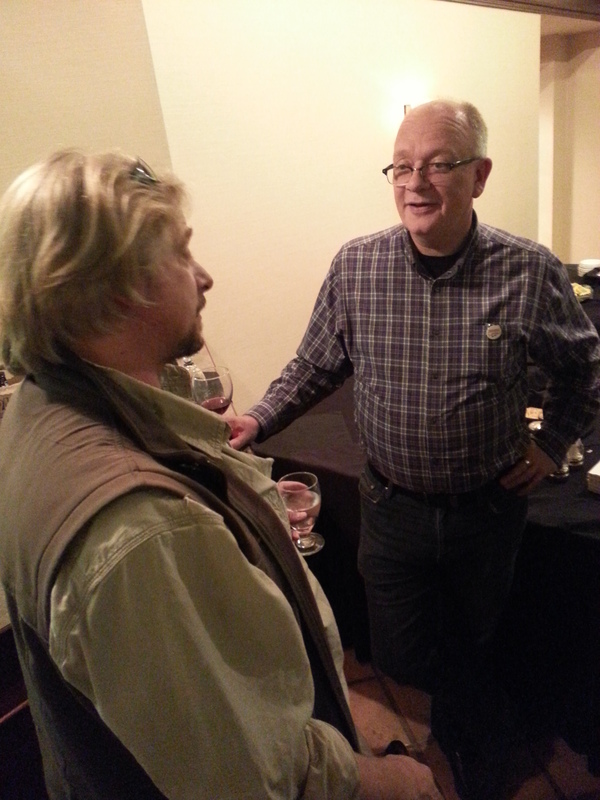 Daniel Foreman of Groove Soldier Productions…obviously making new friends! Saturday also meant street performers! 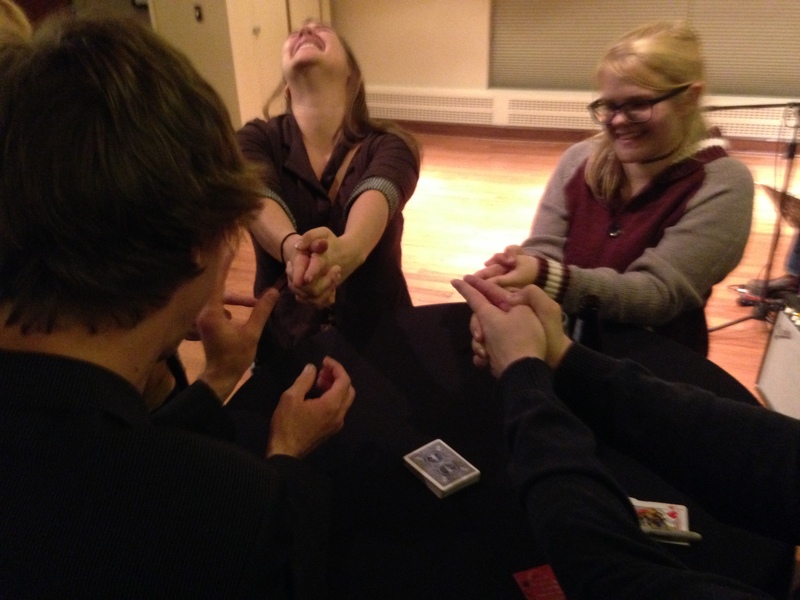 This year we found a young man – Ryan Lackey – who we like to think brought the MAGIC to Culture Days! 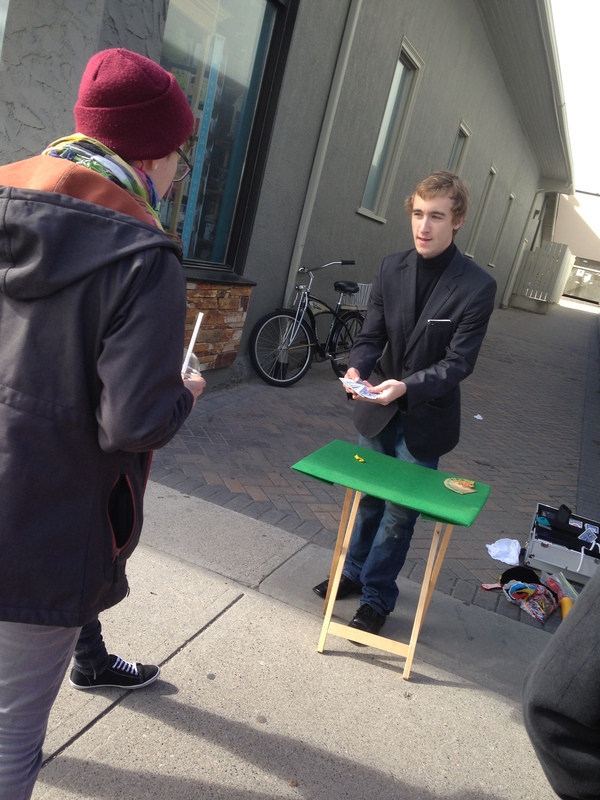 If you ever need a little magic for your event…give this guy a call!! 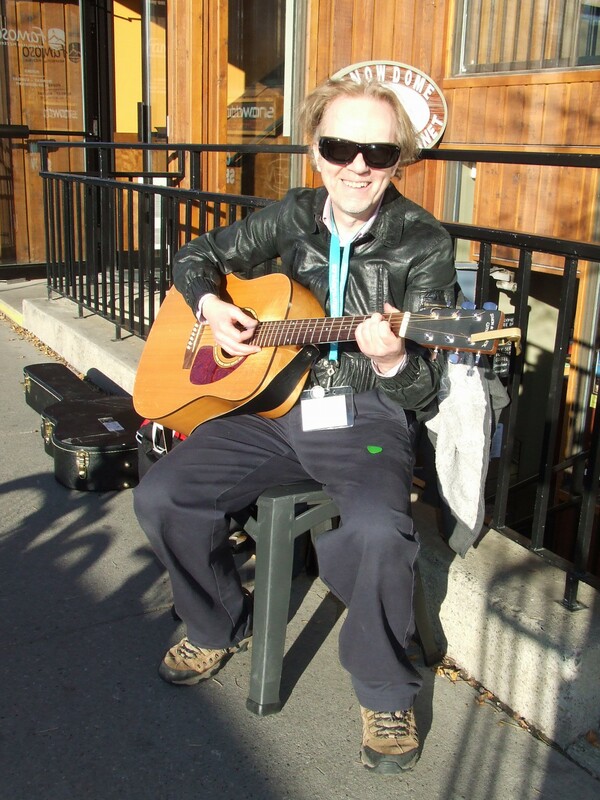 Sunshine, coffee and music…gotta love Jasper in the fall. 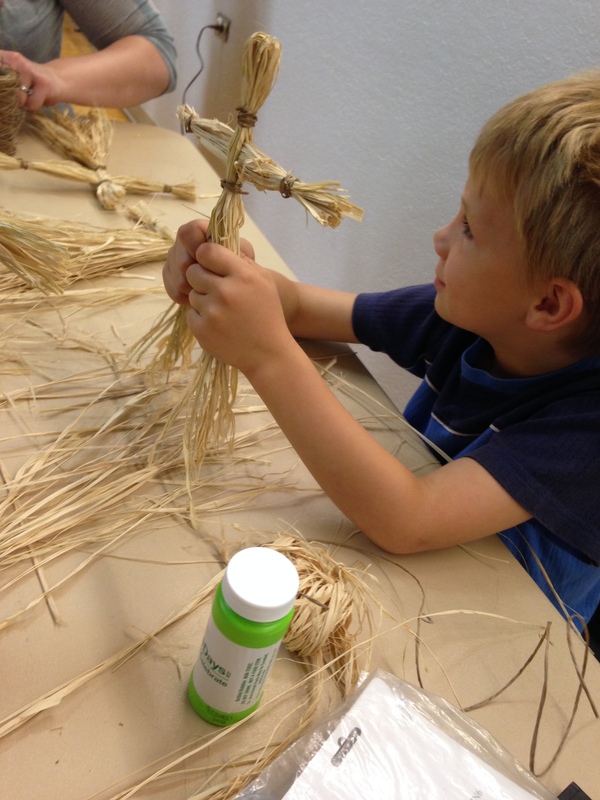 We like to bring the season into the weekend if we can…and scarecrows just seem to be the thing to do for a workshop, to decorate and to entertain! 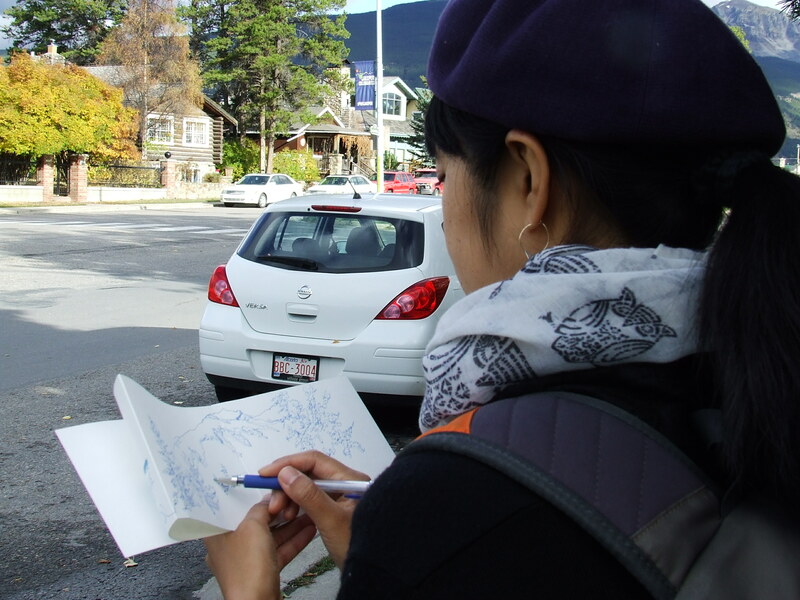 Isara arrived in Jasper last week…on time to join the weekend! She sang at the Raven’ About the Arts Awards. Thanks Isara! Sundog Tours let us put up the Astrodome so Jasper could get excited about the Dark Sky Festival that is just weeks away! 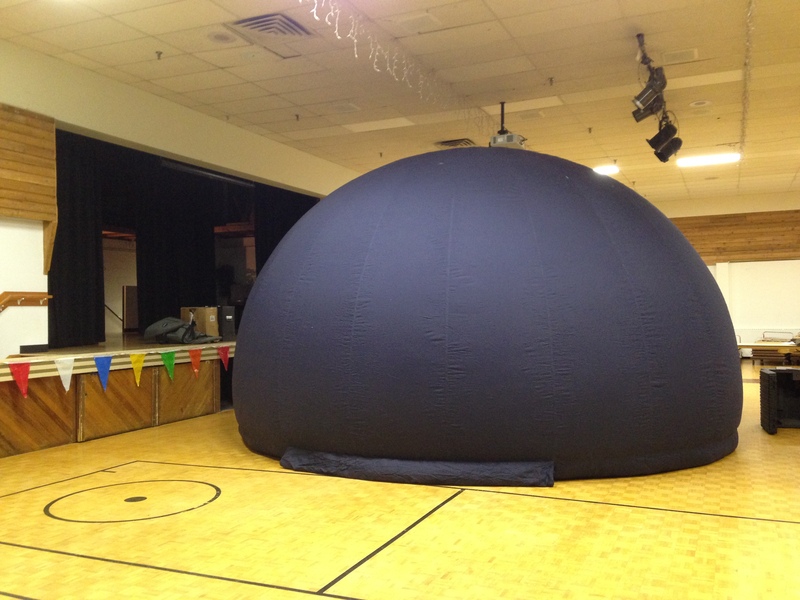 A lot of Jasper residents didnt even know we had a DOME! Jasper has a lot of well kept secrets 🙂 but now that over 40 people got to get inside this amazing attraction…the word will get around! Thanks Sundog! And so we come to the end of the weekend…to the most anticipated event of the weekend…the one that started when a young potter told us about an annual fundraiser at her college. 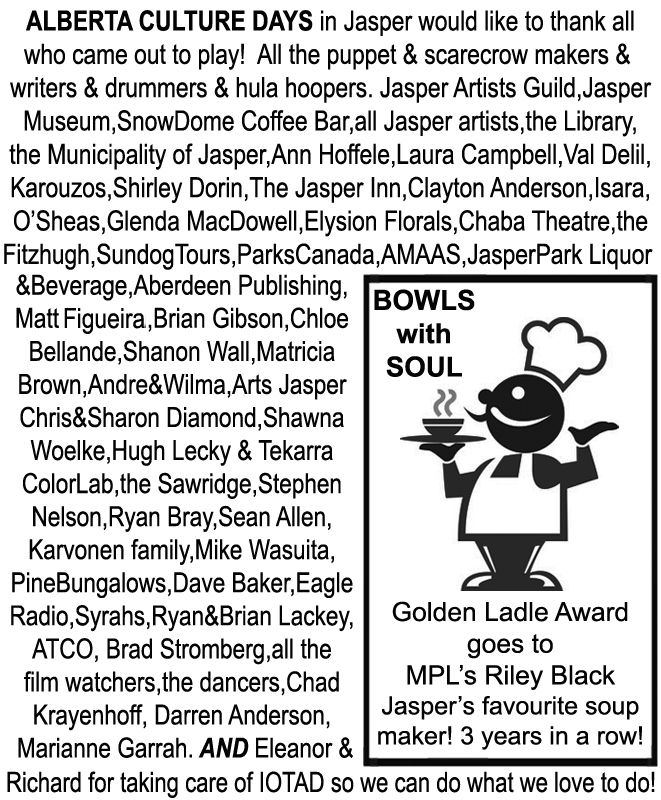 Julie McMath inspired the BOWLS WITH SOUL weekend in 2010. 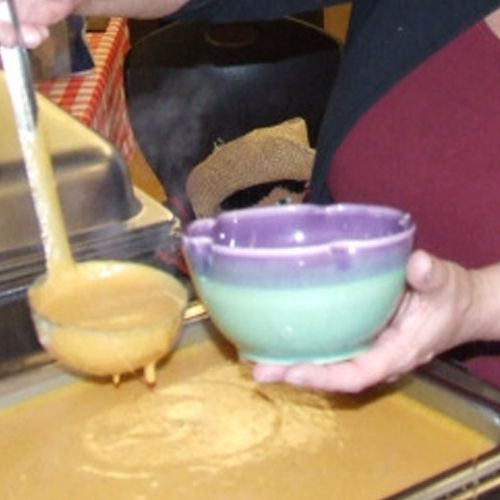 Simply set out handmade bowls, people choose the one that they like, fill it with soup and keep the bowl for a modest fee to support the arts. It has been 4 years now…and while Julie and her bowls are temporarily not available (rumoured to be around for 2015!) 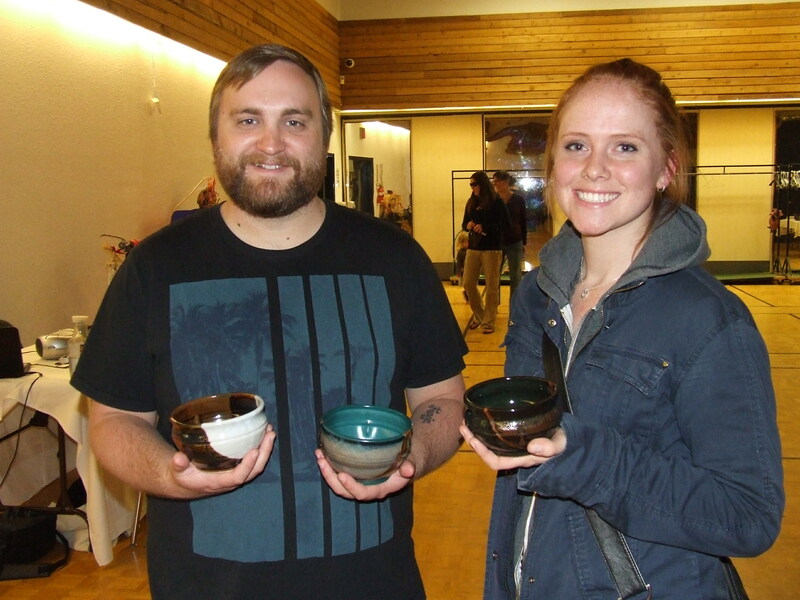 the artist was chosen for 2014, the bowls were picked up at the Connie Pike Studio in High River Alberta…and soup was had! In 2012 we took the idea one stop higher and have the public vote on their favourite soup of the night. The soups are marked with ingredients only…so its fair. 2012 and 2013 saw Mountain Park Lodges’ Riley Black take the Golden Ladle award…two years in a row. 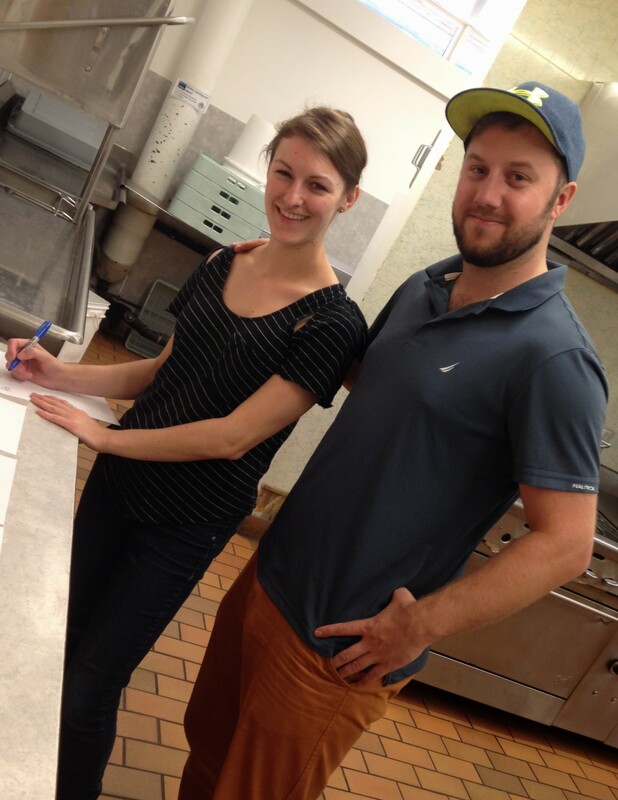 The challenge for 2014 was not only to make great soup…but to unseat Jasper’s two time winner Riley Black. As the soup was warming I asked Clayton Anderson what the chances were of someone new taking the Golden Ladle from Riley. Clayton thought it was likely as Riley had made a humble tomato soup. Well…it was a very good tomato soup…with chorizo meatballs…and again – third year in a row the community chose Riley Black! Arts Jasper always there to help keep order! Decisions Decisions…what the heck…take one of each! 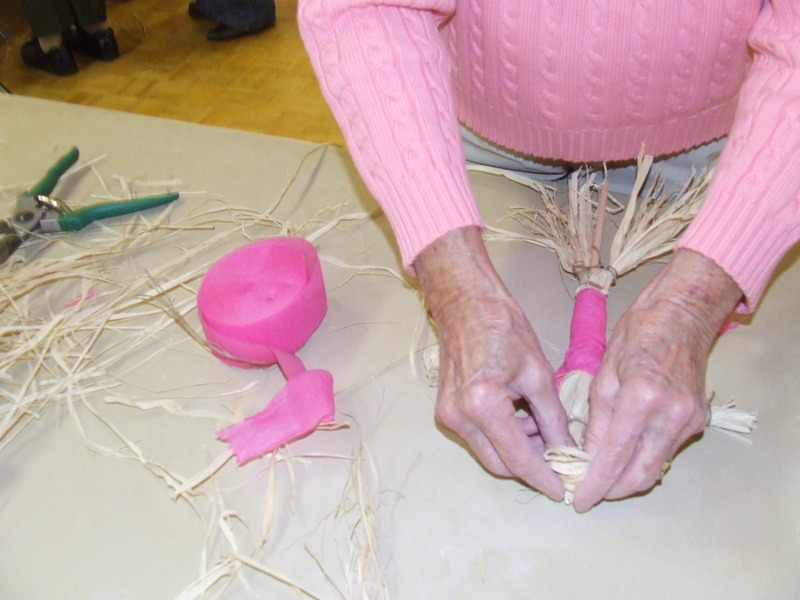 Aw…someone brought a bowl from a past year…Julie McMath will always be part of Bowls with Soul! The man who makes Bowls with Soul a wonderfully smooth running event! Clayton Anderson! 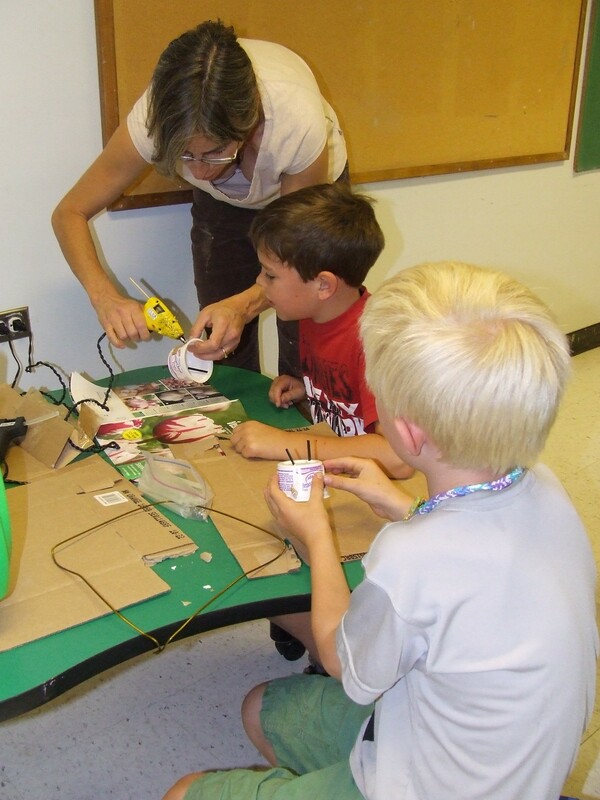 And thanks Kaitie Worobec too…couldnt have done it without you! 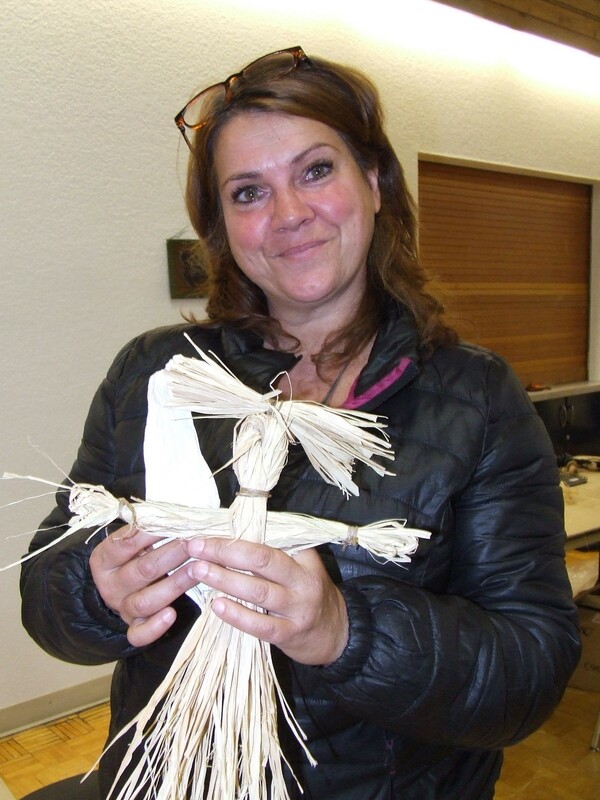 Soup, scarecrows, music, dance, films, hula hoops, drumming, writing workshop, book signing, Scottish music, an Astrodome, awards, new and old friends, puppets, street performers, Marilyn Monroe! I think that’s it! 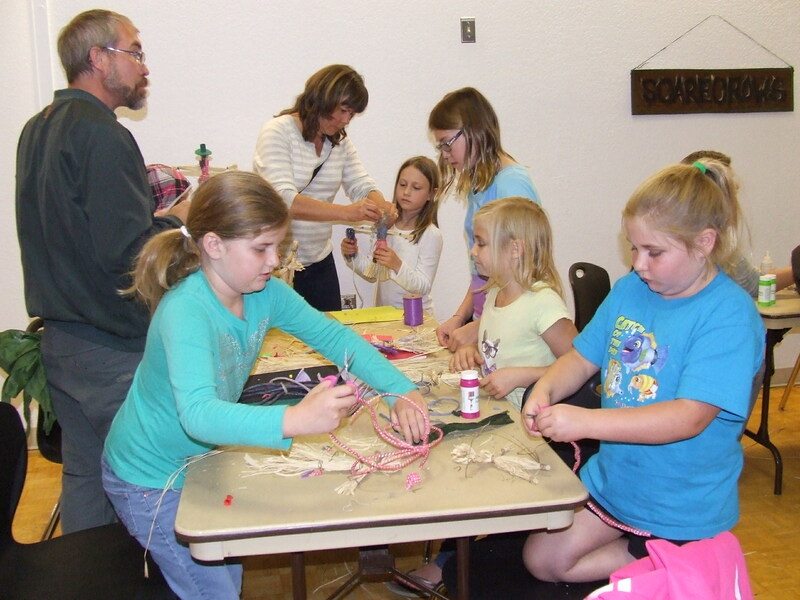 We will post MORE photos on our Flickr site, and of course follow us at the JASPER COMMUNITY HABITAT FOR THE ARTS and THE JASPER SHORT FILM FESTIVAL on facebook to see what’s going on next! 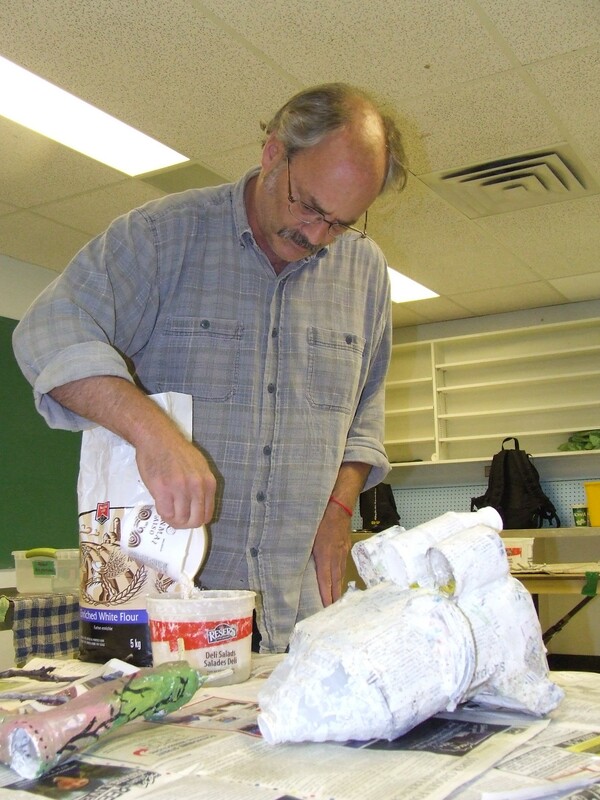 Arts Jasper and the Jasper Artists Guild, the Library and the Museum have facebook pages too! If I forgot someone…apologies…we can always add as the memories flow in! ← One Step Back, Two Steps Forward!